If your child loves learning with StartDOT, you may want to consider adding some real-world tools to expand his or her virtual learning experience. We offer a handful of companion materials that complement the iPad experience quite nicely. Click here to download an order form. 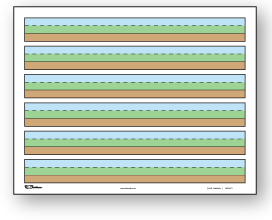 Printed in color, this 8.5” x 11“ paper uses the familiar Sky, Grass and Dirt references used in StartDOT Handwriting. Helps ease the transition to writing on lined paper. 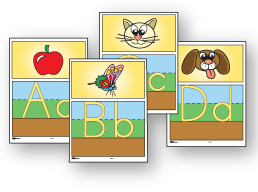 Available in K-1 (6 lines per page) and 1-2 (9 lines per page). Decorate your home or classroom with this fun Chalkboard Banner! One card for each letter and number, displaying the familiar pictures used in the letter stories! Each letter card is 8.5” x 11”.